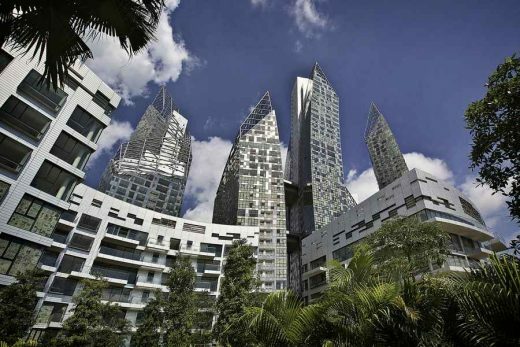 New photos of this fascinating design by Daniel Libeskind in Singapore. Prominently situated at the entrance to Singapore’s historic Keppel Harbor, Reflections at Keppel Bay is a two-million square foot residential development comprised of 6 high-rise towers ranging from 24 and 41 stories and 11 low-rise villa apartment blocks of 6-8 floors – a total of 1,129 units. The series of high-rise undulating towers is the focal point of this project. These sleek curving forms of alternating heights create graceful openings and gaps between the structures allowing all to have commanding views of the waterfront, Sentosa, the golf course and Mount Faber. The design is composed of two distinct typologies of housing; the lower Villa blocks along the water front and the highrise towers which over look them set just behind. The artful composition of ever shifting building orientations, along with the differing building typologies, creates an airy, light-filled grouping of short and tall structures. These ever shifting forms create an experience where each level feels unique as it is not in alignment with either the floor above or below. No two alike residences are experienced next to one another or seen from the same perspective; the result of this design is a fundamental shift in living in a high-rise where individuality and difference is not sacrificed. 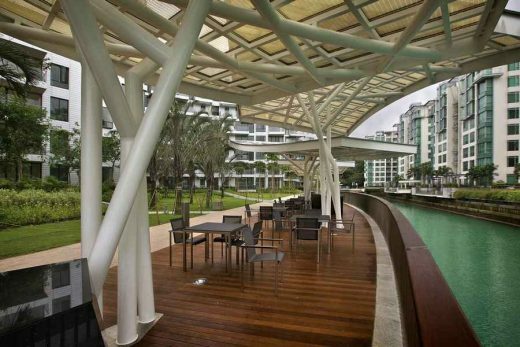 The project was completed in December 2011 and is the recipient of the BCA Green Mark Gold Award from Singapore’s building and construction authority. Keppel Bay, Singapore (March 26, 2010) – Reflections at Keppel Bay, which has topped-out its first tower, will redefine Singapore’s southern coast. Tower 1A is the first of six glass towers to be completed in the waterfront residential development. Reflections at Keppel Bay is comprised of six glass towers and 11 villa apartment blocks featuring 1,129 luxury waterfront apartments along a 750 meter shoreline, all with views of the bay, golf course, lush parks and Mount Faber. The waterfront development is also ecologically responsible, achieving the Green Mark Gold Award by the Building and Construction Authority in 2008. Crowning the towers are lush sky gardens on sloping rooflines, and are linked by sky bridges, providing pockets of open spaces and platforms with 360-degree views of the spectacular surrounds including Resorts World Sentosa and Universal Studios Singapore. At the topping-out ceremony on 24 March 2010, Mr Choo Chiau Beng, Chief Executive Officer of Keppel Corporation and Chairman of Keppel Land, said, “As Singapore undergoes dramatic changes to position itself as an international hub attracting multi-national companies and world citizens, demand for quality residences will grow in tandem. “The positive economic sentiments, improved job market and the buzz generated by the two integrated resorts have also contributed to the return of buying interest in the residential market. Demand for Reflections at Keppel Bay has been strong, with 96% of the 740 launched units sold to date. 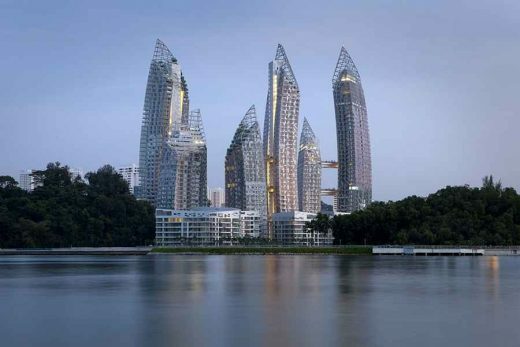 Reflections at Keppel Bay is architect Daniel Libeskind’s first residential showcase in Asia. His other works includes some of the world’s most celebrated architectural icons like the Jewish Museum Berlin, Denver Art Museum. His most recently completed projects include Crystals in Las Vegas – the luxury shopping center in MGM Mirage’s CityCenter which opened in December, 2009 and the 2100 seat Grand Canal Theatre in Dublin which opened last week on March 18th. Mr Libeskind had returned to Singapore to attend and witness the milestone ceremony together with Dr Lee Boon Yang, Chairman of Keppel Corporation, as well as senior management representatives from Keppel and main contractor, Woh Hup.